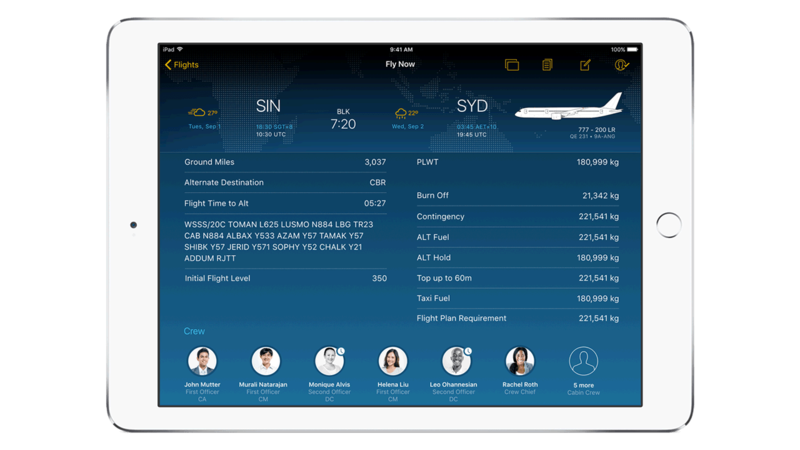 IBM MobileFirst for iOS Fly Now provides pilots with personalized content based on pilot preferences and collaboration tools – all powered by analytics. Using a Touch ID pilots can review all relevant documents and information for that flight in the dashboard view on iPad. Touch ID enables the pilot to securely log in, check-in remotely, view and sign off on the flight plan with ease. Pilots can now easily access pre-flight information and notifications with updates and important messages. Using iMessage and FaceTime, pilots can communicate pre-flight with the previous pilot of the aircraft or the current crew in charge. These alerts and notifications allow pilots to stay current with changing information. The app’s analytics highlights only the relevant sections of the flight plan – based on information like weather conditions, fuel load, aircraft type and route. Critical alerts, such as advisory messages about destination, are prioritized for pilots as first priority based on defined business rules. The app uses analytics to recommend prioritizing specific elements of critical information – including flight plan and airport briefing, based on pilot preferences and mission exceptions.